Life being what it is, maybe a blog series isan’ t the best fit right now. Nonetheless, I can’t show up in my hometown without mentioning a few more people who make it home to me. All Parker High kids, maybe even all school kids in Greenville during his era knew this man. He was the kindly gentleman who asked us how our day was going and made our principals laugh. He always stopped to chat with us as if he had all the time in the world. We didn’t know that behind his genial exterior was a first-class mind with some forward-leaning, even radical ideas and the ability to put almost anything into practice. People wanted to follow him. A long list of firsts, including founding the first adult education center and the first Boy Scout troop in South Carolina, are attached to his name. So are many good works, including a maternity shelter and local YMCA that he sustained. My favorite wild idea of his was establishing a common area in a mill town area where mill families could graze sheep and cows and pigs; he wanted them to take charge of their neighborhood. But the Hollis idea that affected me most was his insistence that mill town kids should be able to get the same excellent education that was available to the children of mill managers and owners. 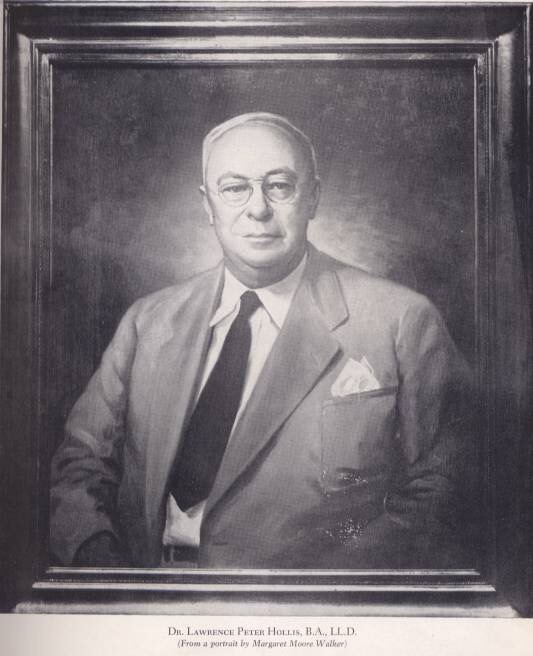 So he founded Parker High School and recruited for us, personally, the best teacher he could find. And they were truly the best. When I went to a fancy college, I was able to keep up and thrive, and I owe it to Dr. Hollis and the wonderful Parker faculty. He was truly a pioneer and a bright light in difficult times. I can’t imagine there isn’t a special place in the Universe for him. 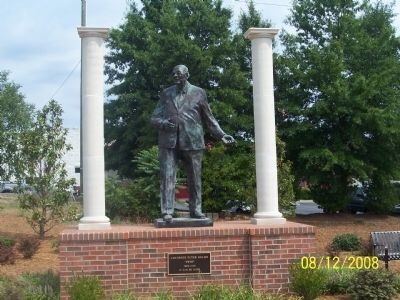 Greenville gave him this statue and a boulevard named for him. I give him my love every time I open a book. I was born into an extraordinary family of women, who, paradoxically, gave birth mostly to boys. My girl cousins therefore are treasures to me. 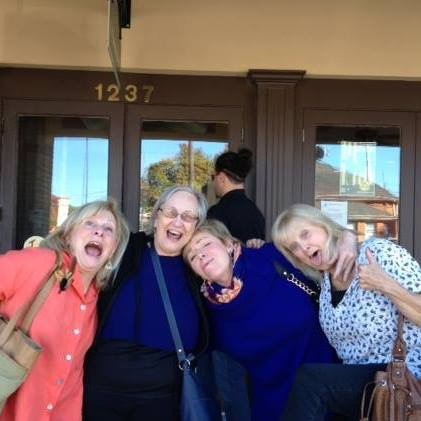 My aunts have all gone on now, but each of them figures in my thoughts near,y every day. One thing they all had in common was a sense of humor; another was courage, whether against the poverty of their youth or the ravages of age. Their pictures sit in my altar and I say a little prayer of thanks for them nearly every day. 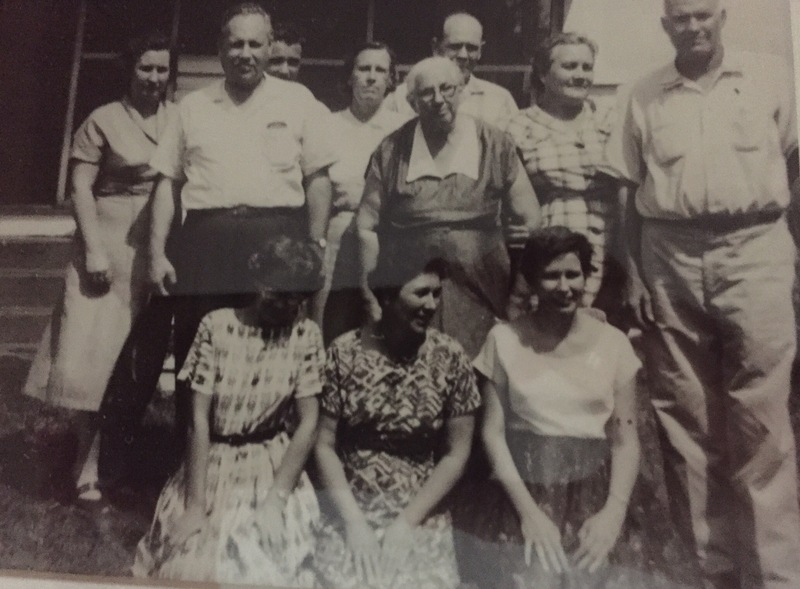 Below, my aunts and their spouses, and, in the center, my Gramma Cannie, who started it all. This picture probably says it all. We have been together since high school and they are the people I enjoy most on Earth, adjuncts to my beloved family. The trouble we got into is one notch short of legendary. We are still trying to find more–the right kind of trouble, the kind that challenges expectations and expresses our attitude toward the world: a bowl of cherries, indeed. They support me and help me and yes, even guide me, in the nicest possible way, the kind that does not make one feel that one’s mind is in backwards. And, if all else fails, they make me laugh. To Debby, Donna, and Carolyn, and to O.J (missing from this photo, but I’ll post one later) I owe my joy in being a girl. That’s why I dedicated my novel to them, along with my aunts and cousins. They are all family to me. EAs forever!